Good morning everyone!!! It's Wednesday again and time for another Color Throwdown Challenge! My sweet friend, Denise, is our hostess and she has picked some yummy looking colors for us this week!!!! Remember, you don't have to use the exact colors...use what you have that comes close...we want everyone to have a chance to play!!! I also want to welcome the fabulous Sherry Cheever...she is our September Guest Designer....Woot!!!! 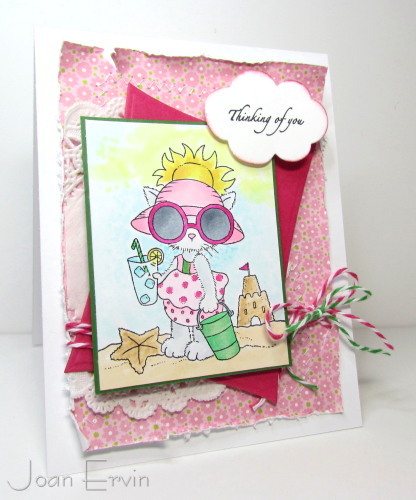 My card features the adorable kitty image from The Cat's Meow set called Summertime Fun with Fibi and Lilly. It was colored with Copics and layered over a diecut layer of Melon Mambo and a doily. The designer paper in the background is from Jillibean Soup and sewing and distressing was done around the edges. The sentiment from See D's was stamped on the cloud diecut and the twine from The Twinery finishes it off. 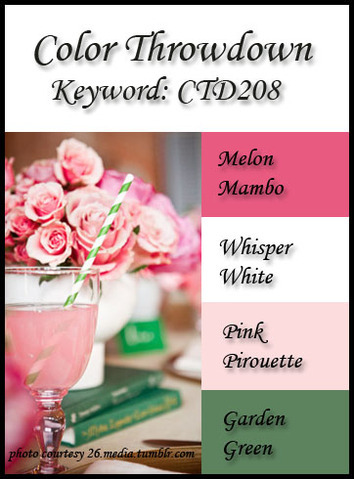 Be sure to add CTD208 to the keywords when you upload your card to an online gallery so we can find your work!! Do you want to see some wonderful inspiration?? 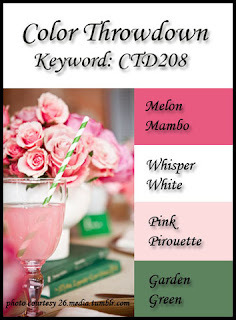 Here are the links to the Color Throwdown Designers..... check out what they created this week! Joan Ervin - Stamping With a Passion - that's me! Thanks for visiting....have a great week!!! I can't wait to see what you create with these colors!!! That kitty is TOO STINKIN' CUTE, Joan! Fabulous coloring, and love the layout with the worn edges on the paper and the doily! Oh my goodness! This is so stinking cute! Love that adorable image!!! Great colours! aww what a cutie...this image is adorable and I love how you colored her...great card Joan.. So glad you got your package...enjoy.. So, so cute!! Love the image and great coloring (as always). Especially love the way you did her sunglasses. Fabulous coloring,love the image!Thank you for joining at Card Mania Challenges! Joan, I am smiling all over my face! lol...What a cute card! Love the image, and those colors are beautiful! Thanks for sharing...hugs! I am loving this cat!!! What a fabulously fun card. So glad your blog is back Joan! I was skeerd it was gone! Love this sweet kitty image and your distressed panels! Pretty colors and a darling card! LOVE that image too. What a sweetheart of an image and I love how you colored it! Precious card! What an adorable image and great coloring. I love how you added the touch of roughness around the papers edge. Oh, how adorable!! Too cute! Fabulous design, Joan, with an adorable image! Hehe, that cat is SOOOO stinkin' cute and I love all the roughed up edges on the DP! What an adorable image, Joan! Love all the texture on your layout. Deine Karte ist traumhaft geworden,wunderschön. stunning thanks for joining us at cmc good luck! Oh my goodness, this is adorable! Love all of your layers and great details with this cute image! Joan this is adorable plus you know I love the shabbiness too! So excited to be playing along with y'all this month! OMGoodness, this is just too darn cute! That kitty is strutting her stuff on the beach and is colored purrfectly! Love this fun card! Pure adorableness Joan! Such a sweet image and card. I just love the image on this card. I had a little chuckle... Cute! What a lovely card. So creative design. From your designing i realize that for the attraction of people creative designs are also must for the plastic card printing. I appreciate your nice work.